Associate Member of the Institute of Electrical Engineers. Son of William Robinson Armstrong and Beatrice Russell Armstrong married in the second quarter of 1907 at St Thomas' Devon. 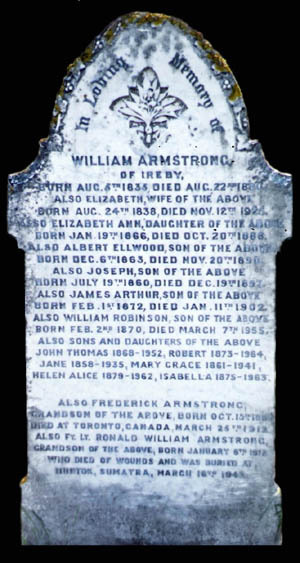 Brother to Alan R Armstrong whose birth was registered in the fourth quarter of 1916 in Bristol, and Marjorie Florence Armstrong registered in the first quarter of 1908 also in Bristol. Husband of Ruth Ann Armstrong nee Underhill, of Buffalo, New York, U.S.A. who he married in the fourth quarter of 1938. The marriage was registered in the district of Surrey Mid E. and Ronald and Ruth had a daughter, Ann E Armstrong whose birth was registered in the second quarter of 1940. Ronald William Armstrong was born on 6 January 1912 in Bristol. He finished his education at Sutton Valence school in Kent and went on to do a four-year training course at Faraday House Electrical Training College. He then spent some time with the Air Ministry before joining the Royal Air Force Volunteer Reserve in December 1939. He took a course at the wireless training school at Yatesbury and passed his exams brilliantly. He was then appointed to command the AMES Radar Station at Great Bromley in Essex. AMES was the Air Ministry Experimental Station which acted as a Chain Home Station. Chain Home was the code name for the ring of coastal radar stations built by the British before and during World War II. The Chain Home Stations, or AMES Type 1, provided long-range detection and provided the first radar to be organised into a complete air defence system and the first such system to be used in wartime operations. Radar stations were often targeted in the early days of the war and in late August 1940 ten high explosives were dropped on the Air Ministry Experimental Station at Great Bromley. No damage or casualties were reported. 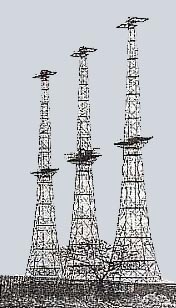 The system relied on tall masts which were difficult to destroy from the air but had the Luftwaffe realised just how essential the radar stations were to British air defences, it is likely that they would have gone all out to destroy them. In January 1941 Ronald went to the Far East and was placed in command of the radar station at Seletar, in Singapore until February 1942. With the staff of No.224 Group, he was ordered to leave at dawn on 12 February. This decision would not have come as a great surprise as on 10 February, the day before the Japanese had landed on Singapore island, and five days before it fell, ships began leaving. They were crowded with what was left of the RAF's ground personnel, shore based Navy men and some Army staff officers. Flight Lieutenant Armstrong boarded a launch with six others and set off accompanied by another five launches. Before dawn on the 16th, whilst off the north-east coast of Bangka Island, they were spotted and shelled by a Japanese destroyer. Ronald's launch was holed and sank soon afterwards. Ronald disappeared overboard, but was found and supported in the water by LAC Gurney Smeed. Eventually they were picked up by one of the other launches and Ronald was found to be badly injured in both feet. He was taken to an improvised hospital which had been set up in temporary barracks in Muntok. Ronald was given the best care and attention available, but a septic condition set in and both feet had to be amputated. He died in his sleep from exhaustion following the second operation. He was buried in the hillside cemetery in beautiful surroundings at Muntok, Bangka Island. His grave was marked by a cross made by Spencer, another RAF man. Flight Lieutenant Ronald Armstrong's name was marked upon it. LAC Smeed visited Ronald's family back in England and told of Ronald's courage and technical ability which had led him to be recognised as a leading expert in the field of radar and wireless. The family headstone pictured above is located in Lower Ireby churchyard, Cumbria. One mystery not yet resolved is Ronald's nickname of 'Bunny Armstrong'. This is how he was known by Banstead locals to such an extent that none remembered his proper name. It is possible that the name is associated with his wife's maiden name of Underhill. Updated 20 March 2008 with full story.